Today, on the fiftieth anniversary of the death of Hu Shih (Hú Shì/胡適/胡适), I’d like to say a few things in his memory. This is, after all, someone I regard as a hero in many ways. I even keep a photo of him in my office. Hu Shi (1891–1962), “the Father of the Chinese Renaissance,” towered over China’s intellectual landscape in the first half of the twentieth century. Among other achievements, he is credited with having made everyday speech respectable as a medium of written communication. Groomed as a traditional scholar-bureaucrat in his father’s footsteps, he had already turned into an iconoclastic renegade by the time he left Shanghai at the age of eighteen to study in the United States. In John Dewey, whose approach to philosophy was to treat all doctrines as working hypotheses, Hu felt he found “the proper way to think.” He and his associates who studied with Dewey at Columbia University established the framework of China’s modern educational system. A dedicated humanist, social reformer and promoter of women rights, he was, at different periods of his life, president of Peking University, president of the Academia Sinica, and ambassador to Washington. To return to the most important point, at least in terms of the focus of this site, it was he, more than anyone else, who helped break the stranglehold of Literary Sinitic (a.k.a. classical Chinese). The vernacular movement he spearheaded is of far greater significance and has had a much greater impact on Chinese culture and people’s lives than so-called character simplification. Yet it receives relatively little attention, perhaps because many do not understand — or do not want to admit — how very different Literary Sinitic is from modern standard Mandarin. 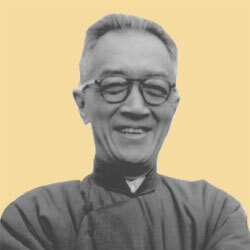 Hu Shih is also the one who, more than anyone else, popularized the use of modern punctuation in Chinese texts, such as through his book Zhōngguó Zhéxuéshǐ Dàgāng and his editions of earlier works. That alone should be enough to earn him the eternal gratitude of all who read texts written in Chinese characters. There’s so much more to the man than this, though most of it falls outside the bounds of this site. So rather than go into it here I will just encourage people to read more by and about him. zhèngrú wǒ bùnéng zuò nǐ de mèng. Sinolingua‘s terrific series of abridged editions of classic Chinese books includes one of my favorites, which may well be the finest novel written in Mandarin during the twentieth century: Qian Zhongshu’s Wéichéng (圍城/围城), best known in English as Fortress Besieged but published by Sinolingua with the English title of The Besieged City. I’m very pleased to announce that Pinyin.info now offers the first chapter of Sinolingua’s edition this book, along with an audio file of it being read aloud. This edition is in Mandarin, in word-parsed Hanyu Pinyin (with Chinese characters underneath) and has a few notes in English as well as mp3 files of the text being read aloud. Here’s the download page: Wéichéng (圍城/围城/). The novel is also available in a fine English translation. At any rate, how things are named is a concern of the current administration, just as it was for the previous one. I’ve given up trying to follow the twists and turns of the name of Revere the Bloody Dictator Shrine Chiang Kai-shek Memorial Hall Taiwan Democracy Memorial Hall. Someone let me know when the dust finally settles. And then there’s the airport. The last time I was on a highway in Taoyuan I noticed that the signs that previously said “CKS Airport” had the “CKS” covered, so they read simply “Airport”. Maybe the new administration can live with that, regardless of what it does about the signage of the airport itself. But what is to become of the official names that weren’t changed in Mandarin but only in English? Please note that I’m not talking about romanizations but about real English names. I’m referring to how the English names of several ministries and other government agencies were changed during President Chen Shui-bian’s two terms in office, though the Mandarin names remained the same. None of the above revised names have been revoked or changed as of today (June 12, 2008 — or 108-06-12, as the Presidential Office would have it). What about the addresses of the Web sites of these ministries and agencies? Council of Indigenous Peoples www.apc.gov.tw APC? According to someone I spoke with at the council, this stands for “Aboriginal People’s Commission” (or maybe “Aboriginal Peoples’ Commission”), a name that dates back to 1996. But I can’t find any search results for that name within .tw domains. Also, neither www.cip.gov.tw nor www.cip.gov.tw leads to anything. But lately the APC site has often been unresponsive. I mentioned to the council that they might want an updated URL; the person I spoke with said she’d look into it. National Languages Committee www.edu.tw/MANDR/ This is under the Ministry of Education, which has changed the URL a few times over the years but has yet to revise the focus in the address on Mandarin (i.e., “MANDR”). Not even under the DPP was this address subject to rectification (zhèngmíng, 正名 ). Taiwan External Trade Development Council (TAITRA) www.taitra.org.tw The old URL of www.cetra.org.tw leads to nothing, not even a redirect. www.taitra.com.tw mirrors the .org.tw address. This doesn’t have a .gov.tw address because it’s a semi-governmental organization. Overseas Compatriot Affairs Commission www.ocac.gov.tw “Overseas Chinese Affairs Commission” and “Overseas Compatriot Affairs Commission” share the same abbreviation. One URL fits all. Thus, so far the new English names have survived.